Born in Buffalo, New York, and raised in Santa Cruz, California, guitarist Carmen Grillo started his musical journey by playing saxophone and drums at the early age of 5. When his father took a young Carmen to a Ventures concert, he decided then and there he wanted to be a guitar player. Carmen credits The Beatles, Eric Clapton, Jeff Beck, George Benson, Ray Charles and Aretha Franklin among his early influences. 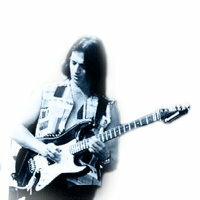 In his teenage years, Carmen fronted several local Santa Cruz bands, including Feel Machine and White Eyes, and regularly played all the local venues. In pursuit of more creative endeavors, Carmen left Santa Cruz in the late 1970s and moved to Los Angeles. He soon became an in-demand session guitarist and vocalist. His credits in the studio include Bill Champlin (Chicago, Sons of Champlin), Rita Coolidge, Donna Summer, Tom Scott and Tim Weisberg to name a few. From 1980 through 1986, Carmen toured the world and recorded with Rita Coolidge (Higher and Higher, We’re All Alone), whom he credits with inspiring him to perform at a consistent and professional level night after night, regardless of conditions. Also, during that same time period, Carmen toured with Bill Champlin promoting his solo albums, Bill Champlin Single and Runaway. In 1985, Carmen co-wrote One More Day with James Pankow of Chicago, which appeared on the platinum selling album Chicago XVIII. Carmen then joined the legendary horn-based soul band Tower of Power in 1988, where he became a driving force within the group. His writing, singing and guitar playing made him easily recognized by music fans around the world. He performed and recorded with TOP for the better part of a decade before leaving in 1997 to pursue other musical interests. Those interests included opening the doors to his recording studio, Big Surprise Music, where he is a music producer and the chief engineer. One of his first recording projects was his solo debut, Both Sides of the Coin, which showcased all of his talents, from the sensitivity of his lyrics to the fire in his guitar playing. His many recording projects include producing long-time Tower of Power bass player Rocco Prestia’s solo debut, Everybody on the Bus, in 1999, which reunited the original Tower of Power rhythm section. 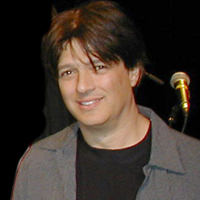 Carmen also recorded TOP’s original trumpeter and horn arranger Greg Adams’ most recent CDs Firefly and Cool to the Touch. Carmen is currently a member of the Bay Area band the Sons of Champlin, who were an early influence in the San Francisco music scene of the 1960s and 70s. The Sons continue to have a strong and loyal following to this day, and maintain a high level of musicality. Among his most rewarding experiences now are mentoring others and sharing his vast knowledge, experience, humor and wisdom with future generations of aspiring guitar players and recording engineers, as well as being the Musical Director of Arise Christian Center in Westchester, California. In addition, Carmen is a voting member of the National Academy of Recording Arts and Sciences (NARAS), which presents the recording industry’s most prestigious award, the GRAMMY. Carmen lives in Encino, California, with his wife, Denise, and their dog, Rocco.